Are you a frequent traveller who loves going on a holiday? or Are you regularly out for a business or an official trip? If yes, this blog might seem to be of your interest, as we shall be highlighting a whole range of exclusive and Best Travel Credit Cards in India. Travelling may be a passion for some, a pleasure for others and a business tour for the rest. In any form, you surely require the best tools in possession to make your personal or official trip a comfortable one. This is when Travel credit cards come to your rescue and help you in getting handsome offers and save big. Travel cards can provide you excessive privileges in the form of air miles that can be redeemed for flights and hotel stays plus a plethora of other travel benefits. However, due to the wide collection of travel credit cards around, it becomes really difficult to choose a specific one based on your travel requirements. 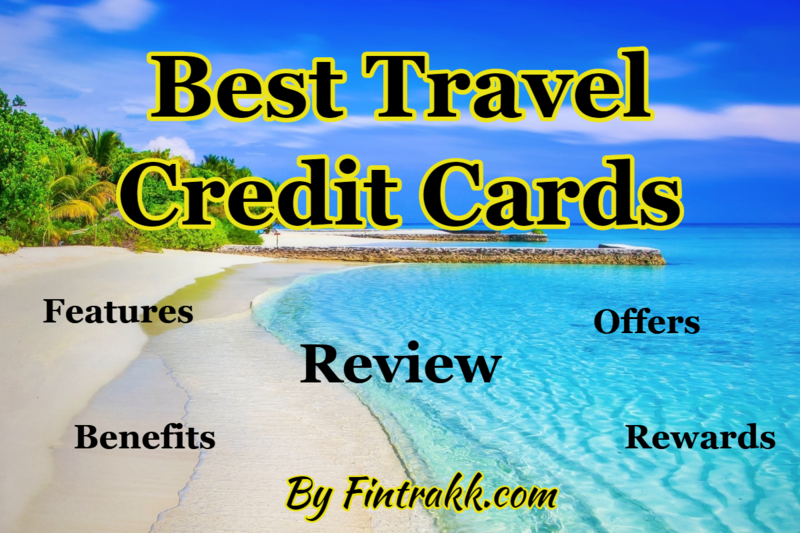 So, here we are highlighting a handpicked list of some of the popular credit cards that can offer you huge travel discounts and big rewards altogether. What to consider while applying for a Travel credit card? A Flexible & efficient Rewards & Miles program. An extensive array of benefits on flights & hotel bookings. Big Savings on Dining, Shopping and entertainment is a perfect value addition! Getting attractive returns on the most regular and important purchases that you make is actually a great deal. If you grab a good credit card, you can save a lot here! Now, Let’s begin our journey and dig deeper into the various travel credit cards offered by some of the leading banks, to ease out your travelling experience. Moreover, if you are looking for an overall good rewards credit card, don’t miss to checkout Citibank Rewards Credit Card. Talking about best travel credit cards, how can we miss to mention the Citi PremierMiles credit card. This one surely tops the list of credit cards that are specially designed to cater to your travel demands. The annual fee for this travel credit card is Rs.3000 only. However, if your Citi PremierMiles credit card is linked to your Citi Priority account, you can enjoy first year annual fee reversal. On your first spending of Rs.1000 or more within 60 days of issuance of card, you get to earn 10000 miles as enrolment bonus. Wow! This sounds really cool! Enjoy 10 miles for every Rs.100 that you spend on any of the airline transactions. Grab 4 miles for every Rs.100 that you spend on other transactions. If you are a part of the Frequent Flyer Program(FFP) for any of the airlines, here’s the catch! You can double your benefits at lesser price. You can acquire your regular FFP miles plus get more miles by booking your tickets through your Citi PremierMiles credit card. An icing on the cake! Right! You can also transfer miles to airline and hotel partners. Get 1 Frequent Flyer Air Mile on transfer of every 2 miles to specified airlines. You get complimentary access to different airport lounges across India that further makes your expedition a memorable one. 24×7 SMS tracking of your reward points in an easy manner. You can redeem the evergreen miles for flights without anytime as per your convenience. The annual fee is Rs.4999( one-time). This one also fits in the category of best premium credit cards in India. You get a magnificent welcome gift in the form of 20000 reward points, one you pay your joining fee. A bulk of rewards in a single go! Amazing! On every Rs.100 that you spend, gather 4 reward points. Keep collecting a set of massive bonus reward points based on your annual retail spending through your Air India SBI Signature Credit Card. Easily convert the accumulated rewards points into Air India Miles wherein 1 Reward point=1 Air India Mile. Tickets booked through Air India offices/call centres can fetch you 10 reward points on every Rs.100 spent. Earn upto 30 reward points for self booking and upto 10 reward points for others through airindia.in, Air India Mobile application. Airport Luxury Lounge access: You can enjoy access to leading international airport lounges in addition to complimentary visa lounge access program in India (subject to certain conditions). If you wish to have a real rewarding journey and are in search of a good premium credit card, this SBI card might be your ideal choice. Amex Platinum Credit card is yet another wonderful addition to the best travel credit cards list. You earn 5000 Milestone Bonus Membership Reward points that can be easily redeemed for travel vouchers of Rs.4000. Enjoy Milestone Bonus Membership Points as per your spending habits. Firstly, you earn reward points as a welcome bonus. Next, you can earn additional travel vouchers, if your spending reaches Rs.1.9 lakhs per year. If your annual usage through this Amex credit card reaches Rs.4 lakhs you further get exclusive gifts & travel vouchers. The travel voucher offered from Taj group is really enticing! Enjoy complimentary visits to airport lounges across the country. Save money & experience wonderful privileges while booking through MakeMyTrip.com. For every Rs.50 spent you get 1 Membership point ( except for fuel, insurance, utility and cash transactions). You also get the choice to redeem your Membership points from 600 other redemption options. American Express Selects Dining Programme: Get upto 20% discounts at various premium restaurants. You can also avail Complimentary membership to Priority Pass through your Amex travel card. Here, we shall be discussing the Axis Miles & More World Credit Card that provides you decent travel advantages. 2. Welcome Bonus: Earn 5000 miles on joining as a welcome bonus on your first transaction. You also get 3000 as annual bonus miles. For Rs.200 of eligible spends : You get 4 miles. For Rs.200 spent on movies bookings at PVR : You get 20 miles. You can also earn spend linked miles upto 24000 miles, if your spending touches Rs.1 lakh monthly. Miles can be redeemed for exciting rewards like flights, hotel stays, shopping, car rentals etc. You can easily earn upto 32000 award miles during the first year if the card is used systematically. Note: There is another variant Axis Bank Miles & More World Select Card that can offer you better and advanced features, of course at a higher fee. You can earn extra miles upto 55000 miles with the Miles & More World Select Card at a Standard Joining fee of Rs.10000 and Standard Annual fee of Rs.4500. So, this one seems to be on the expensive side and is affordable by the elite class. Fuel surcharge waiver upto 1% on transactions between Rs.400 and Rs.4000 at petrol pumps across India. Dining delights & discounts at partner restaurants throughout India. Complimentary access to airport lounges and Priority Pass Membership. This airline co-brand travel card offered by HDFC in tie-up with Jet has also gained popularity recently. 1. First year Fee: Rs.2500 and Renewal Fee: Rs.2500 You can get renewal fee waiver if your annual spending reaches Rs.3 lakhs in 12 months prior to renewal. 2. Welcome benefits: Enjoy upto 7500 Bonus JP Miles plus one way complimentary Jet Airways ticket wherein the base fare is waived off. For every Rs.150 that you spend on retail purchases, you get 6 JP miles. For every flight ticket booked at www.jetairways.com you get 18 JP miles. JP miles are offered only on retail purchases and not on cash advances and fuel spends. ALSO READ What is good CIBIL Score? How to improve your Credit score? Tier Points: Avail 1 “Tier point” in your JetPrivilege Frequent Flyer Membership for every Rs.2 lakhs that you spend through your JetPrivilege card. Discounts on air tickets, premier check-in facility for domestic Jet Airways flights and excess baggage allowance benefits can be availed. You can enrol the complimentary Priority Pass Membership. Free visits to international airport lounges (subject to conditions). *Taxes shall be charged in addition to the annual card fee as applicable for different credit cards. Looking at the fee and extended privileges attached to these travel credit cards, these are primarily a variety of Premium or elite category credit cards. Most suited for individuals having a definitive earning source or high net worth individuals who are frequent flyers. If you are a flying freak, a regular traveller, searching for a bulk of rewards, these travel credit cards are your perfect destination. There are a massive range of other travel credit cards as well. We have covered the most common ones that are preferred by different category of users. Remember, you need to have a clean credit history and a good CIBIL score to get hold of any of the Premium or Super Premium credit cards. High income and a great credit score are the primary factors that are considered by banks while approving these credit cards. Important: The details provided above are on “as is” basis and for informational purpose only. There might be changes in the offers, rewards and other relevant details from time to time. Please clarify all the specific credit card offers with the respective banks before applying for them. Don’t worry, if you still couldn’t find a credit card of your choice or these cards seems to be a bit expensive for your wallet. You can scroll through our collection of Best credit cards in India designed for the common man and probably get a reasonable answer there. How did you like our list of Best travel credit cards in India? Which travel credit card do you prefer to take along while on travel? Feel free to share your experiences or feedback on any of the travel credit card that you have used. Don’t forget to describe the unmatched privileges that you got with any of the popular travel cards. « With Rentomojo, Say Goodbye to the Horrors of EMIs! Grab Citibank Rewards Card Enjoy Exciting Offers & Save Big!